My youngest daughter Alicia is the false tanning queen in our house, she first used false tan around 3 years ago and had no idea how to apply it correctly and had a few disasters but she is now a pro tanner and is so good her friends come to her all the time so she can apply their tan. We were recently chatting about tanning when Alicia was preparing to tan for an evening out, she was saying how tanning herself was hard work when it came to tanning her back, literally a few days later I received an email asking me if I would like to try the Got Your Back tanning mitt, it was perfect timing and I knew immediately who would be being my guinea pig for this review post. The Got Your Back tanning mitt from the company Bronzie comes in plastic domed shaped packaging with gold writing on and looks very classy, inside is the Get Your Back tanning mitt and instructions, which I have to say are really useful. 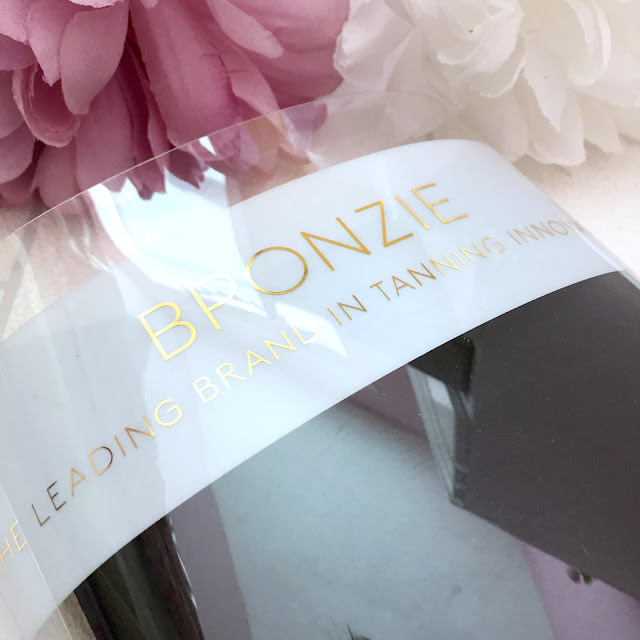 Bronzie was founded in the summer of 2014 by beauty expert Leanne LeGuen and tanning expert and celebrity spray tanner Eloise Maryam, and together they have taken tanning innovation to the next level. Bronzie was born following many self tanning and beauty disasters Leanne and Eloise encountered during their many years of beauty salon experience, from this experience Bronzie began with the philosophy to create clever solutions to the problems faced by their clients. Bronzie is devoted to making false tanning fun and easy for everyone. The Got Your Back tanning mitt is a 3 in 1 mitt with 2 mitts attached to a middle section and is made from luxurious velour fabric which feels incredibly soft, the mitts are lined with a protective film so your hands will stay dry and tan free and the mitt also has elasticated panels meaning it will stretch so you can tan your whole body. You can use any type of false tan with the mitt, spray, mousse, gel or lotion and the mitt is machine washable and reusable. The mitt comes with an instruction leaflet that is split into sections showing how to tan your arms and body, legs and back. Alicia's preferred type of false tan to use is a mousse, she applied the mousse directly to the mitt and worked the tan into her body, she said the mitt applied the tan well and the material is lovely for buffing the tan into the skin, she used the mitt end of the tanning mitt to tan her arms, chest, stomach and legs. To tan her back Alicia bent over slightly so her back was arched as it made it easier to tan her lower back where it naturally curves in, she applied her tan to the middle part of the tanning mitt and used both hands to move the mitt back and forth (the same way you would dry yourself with a towel) she found the tanning mitt easy to use and likes the fact she can now tan her back without assistance or acting like she's some sort of contortionist. To tan her face Alicia pressed the mitt onto her face using the tan that remained on the mitt and then used a makeup buffing brush to buff over her face as she always does when she tans her face, she also uses a buffing brush to tan between the base of her fingers as this is the best method for her. Alicia is really pleased with the Got Your Back tanning mitt, she said the instructions it comes with are easy to use and after using the mitt a couple of times, she got to grips with it completely and got her tanning regime using the mitt down to a fine art, she suggests maybe having a play about with the mitt without tan at first to try it out rather than just going straight in with tan. The mitt buffs the tan into the skin well, and doesn't soak up lots of tan either meaning it isn't wasteful, it is easy to use, applies the tan well and you can tan your whole body without the assistance from someone else. The mitt feels very luxurious and soft and I would feel bad pouring tan onto the mitt as it feels so lovely but the best bit is it's machine washable and washes really well, feeling just as soft once washed as it always did. 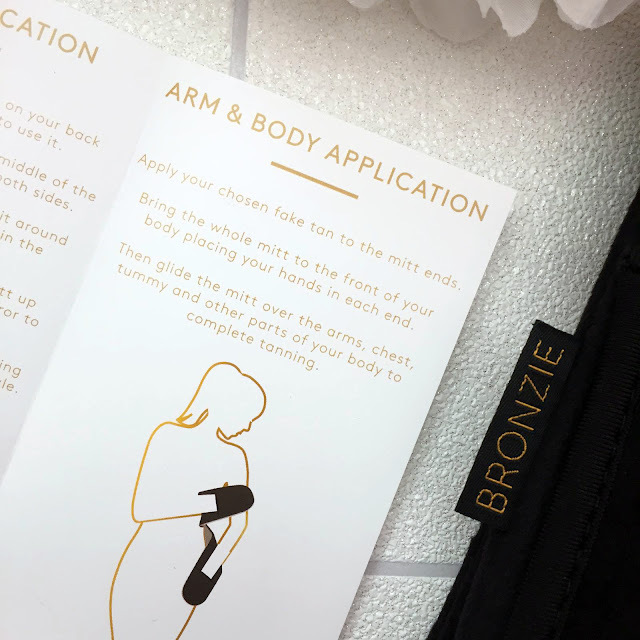 If you use false tan and want to be able to tan your whole body with ease, check out the Got Your Back tanning mitt available from the Bronzie website for £14.99. Have you used the Got Your Back tanning mitt? Is it something you would like to try? Let me know in the comments.